Joanna Young is an illustrator, photographer and painter. She studied in London and Paris, and spent many years living in Brazil and Greece, before returning to London where she now lives with her children. 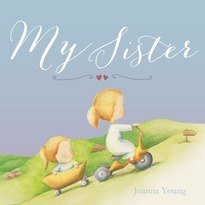 Joanna wrote and illustrated 'My Sister' based on her own relationship with her sister as well as observing the love between her two daughters. She is now working on her next story. When she is not illustrating picture books Joanna enjoys painting murals in children’s rooms and stage sets for children’s school plays. She recently created headdresses depicting African animals. She has always enjoyed oil painting and exhibits her paintings to various audiences around London. Her travels introduced her to the joy of language, but also allowed her unforgettable and invigorating imagery and extreme colour and light, all of which contribute to her approach to painting; her favourite form of communication. Her love of children and purity are what stimulate her, and her love and keen eye for colour and contrast dictate her style.